I've reviewed a couple of books by Susan May Warren, and I have loved them. The Nightingale was set during World War II, and I found the detail to be amazing. More recently, I read My Foolish Heart, which is modern-day, but fabulous because it so perfectly captures Minnesota. So when LitFuse announced a book tour for Heiress, by Susan May Warren, I really didn't care what it was about, I knew I wanted to read it. They can buy anything they want—fame, power, beauty, even loyalty. But they can’t buy love. The beautiful and wealthy heiress daughters of August Price can buy everything their hearts desire. But what if their desire is to be loved, without an enormous price tag attached? When one sister betrays another for the sake of love, will she find happiness? And what happens when the other sets out across the still untamed frontier to find it—will she discover she’s left it behind in the glamorous world of the New York gilded society? What price will each woman pay for being an heiress? Set in the opulent world of the Gilded Age, two women discover that being an heiress just might cost them everything they love. So I started reading. And I had a really tough time getting into it. The first chapter (available here) has great detail. But the two sisters -- Esme and Jinx -- I just could not identify with them at all and I just did not care. Since this is a review book, and since I have loved everything else I've ever read by Susan, I persevered. Somewhere about the third or fourth chapter, I did start to care. About Esme anyway. I no longer had to force myself to read, which was a good thing. The book is split up into a few sections. The first one, Sisters, takes place in New York City in 1896. The final section, Heiress, is back in New York City in 1917. In between, we spend time in Newport, Rhode Island with one sister, and in Silver City, Montana with the other. My opinion? Fantastic book. There is simply no better word. The characters are so real, and not just the sisters, but everyone. Like her other books, these characters are complex and certainly imperfect. And everything doesn't wrap up neatly in a little package. Mistakes have consequences, and the "magic author wand" isn't used to make everything end happily ever after. There were a number of places where I was a little stunned by the serpentine nature of the plot. Just when I thought I had figured out where it was going, it snaked off in a different direction entirely. Susan brings out a great message with virtually no preaching. I love that about her works. The central question relates to being blessed. Clearly, as members of the 'nobility' of New York, the sisters are blessed materially. But is there more than that? What does "blessed" mean to me? Fantastic. Or did I say that already? This is the first book in a series, the Daughters of Fortune series. I will be reading them as they come out. Wow. You can read what other people thought of this book at the LitFuse Blog Tour page. 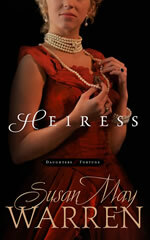 Heiress, a richly complex historical romance, is the first in Susan's three book Daughters of Fortune series. In honor of Heiress’ debut, Susan is hosting a FABULOUS Gilded Age Giveaway and giving away an opulent prize pack fit for an heiress! Click one of the icons below to enter. But do so soon - this giveaway ends 10/5/11. The winner will be announced Thursday, October 6 on Susan’s blog.